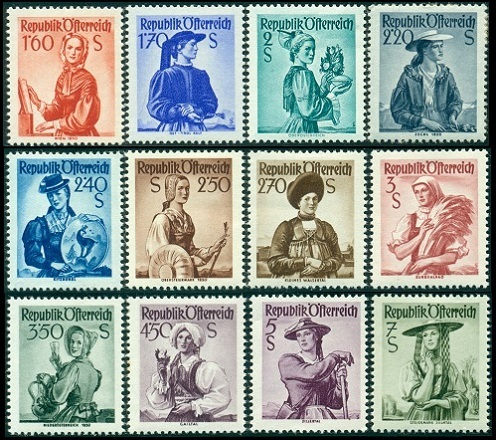 New definitive postage Austria stamps debuted in June 1948. 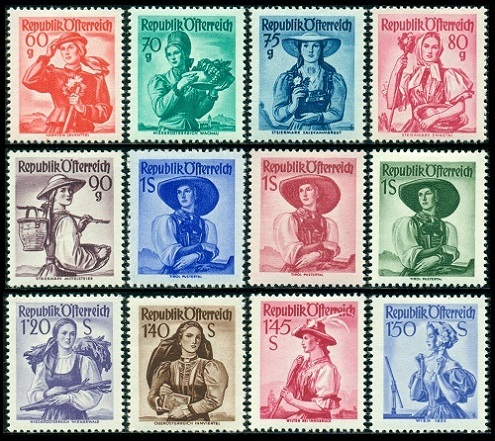 This new definitive postage stamp series featured regional costumes, and over its ten year lifetime, a massive number of varieties were produced, making this series a collecting specialty in itself. 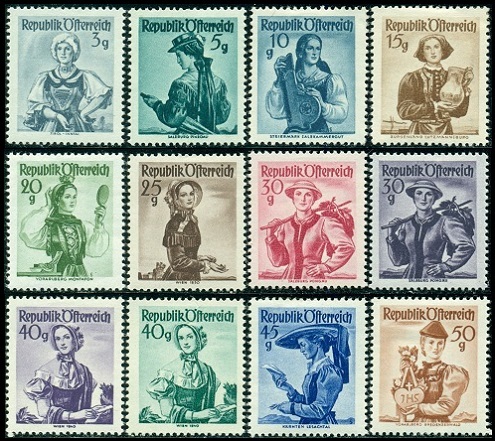 The thirty-six major-type Regional Costumes definitive Austria stamps shown above (Mi. #893-26, #978-80, Sc. #520-56) were issued beginning in June 1948, with additional printings continuing through 1959. The major mint condition examples, without regard to varieties, are shown above. All of these Austria stamps, from the 3 G. denomination through the 7 S. denomination are photogravure, perforated 14 x 13 1/2, and they are printed on unwatermarked grayish or white paper. 03 G. (1950) - Inn Valley, Tyrol. 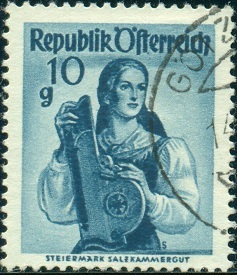 05 G. (1949) - Pinzgau, Salzburg. 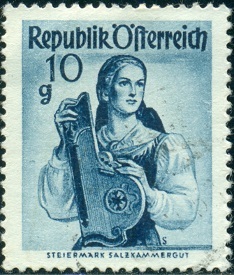 10 G. (1948) - Salzkammergut, Styria. 15 G. (1948) - Lutzmannsburg, Burgenland. 20 G. (1948) - Montafon Valley, Vorarlberg. 25 G. (1949) - Vienna (1850). 30 G. (1948) - Pongau, Salzburg. 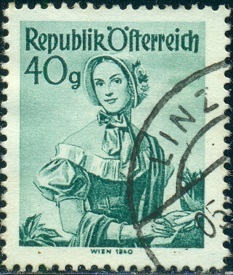 40 G. (1948) - Vienna (1840). 45 G. (1948) - Lesach Valley, Carinthia. 50 G. (1949) - Bregenzer Forest, Vorarlberg. 60 G. (1948) - Lavant Valley, Carinthia. 70 G. (1949) - Wachau, Lower Austria. 75 G. (1948) - Salzkammergut, Styria. 80 G. (1949) - Enns Valley, Styria. 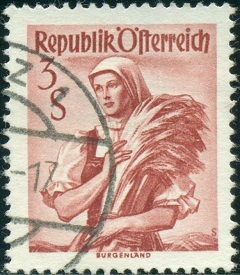 90 G. (1949) - Central Styria, Styria. 1.00 S. (1948) - Puster Valley, Tyrol. 1.20 S. (1949) - Vienna Woods, Lower Austria. 1.40 S. (1948) - Inn District, Upper Austria. 1.45 S. (1951) - Wilten, Innsbruck, Tyrol. 1.50 S. (1951) - Vienna (1853). 1.60 S. (1949) - Vienna (1850). 1.70 S. (1950) - East Tyrol. 2.00 S. (1948) - Upper Austria. 2.20 S. (1952) - Ischl, Upper Austria. 2.40 S. (1951) - Kitzbuhel, Tyrol. 2.50 S. (1952) - Upper Styria (1850). 2.70 S. (1951) - Little Walser Valley, Vorarlberg. 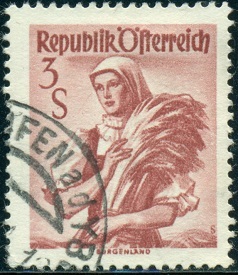 3.00 S. (1949) - Burgenland. 3.50 S. (1951) - Lower Austria (1850). 4.50 S. (1951) - Gail Valley, Carinthia. 5.00 S. (1948) - Ziller Valley, Tyrol. 7.00 S. (1952) - Sulm Valley, Styria. NOW, for the technical aspects of these issues. As said before, this series could be a separate specialty in itself. For anyone wishing to specialize in this series, the specialized Netto or Michel catalogs for Austria are an ABSOLUTE NECESSITY. My overview of the technicalities will be brief. Refer to the specialized catalogs for listing details and additional descriptions. There are TWO MAJOR TYPES, and they have to do with the rastering measurements. The photogravure images on these Austria stamps are made up of raster lines, tiny dots of color, similar to what we refer to today as pixels, as they are combined to make-up a bitmap image. Over-sized examples of each of the types are shown in the images directly above. Type I - Wide rasterizing (70 raster lines per centimeter). Poorer impression. Fine details have obscure appearance. Type II - Narrow rasterizing (100 raster lines per centimeter). Better impression. Fine details have sharper appearance. x - Grayish paper. Shiny yellowish gum. z - Bright white paper. Tan to rose gum with no ribbing. xa - horizontally ribbed gum. xb - vertically ribbed gum. y - Dull white paper. White gum. ya - virtically ribbed gum. yb - gum without ribbing. The chart above indicates that there are up to TEN collectible varieties of many of the Austria stamps shown in the images at the top of this page. That is quite a challenge. There are also many collectible plate faults on these Regional Costume issues as well. See the specialized catalogs for detailed listings of them. The 10 S. denomination Regional Costumes definitive stamp shown above (Mi. #926, Sc. #556) was issued on March 13, 1950. This stamps is engraved, perforated 14 x 13 1/2, and it is printed on unwatermarked grayish paper. 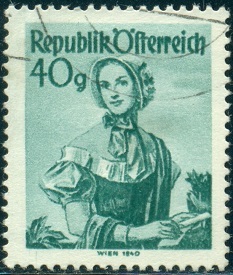 The design of this stamp features a Viennese Woman of 1850. This stamp comes with two types of gum. The first is shiny yellowish, horizontally ribbed gum. The second is white gum with vertical ribbing or cross-ribbing. The white gum varieties are much more expensive.